Any company that sells products to customers will have a supply chain, and it’s a make-or-break aspect of doing business. Proper supply chain management is a complex task, and addressing all of its components can help you get the bigger picture right. We’ll start with logistics because many people think that supply chain and logistics are one and the same, and they’re not. 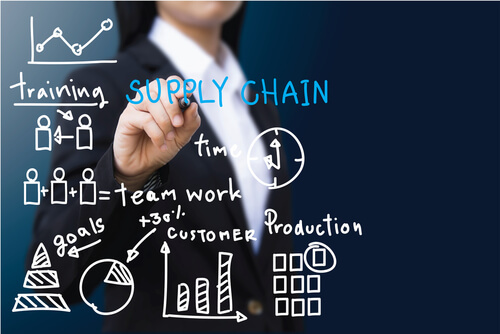 Supply chain management is a broad term, and logistics is just one part of it: the management of the movement of the goods that business uses. This entails managing shipping companies, freight forwarders, customs brokers, and parcel delivery companies, to name a few. Along with warehousing, shipping is one of the biggest expenses in the supply chain, so it’s essential to get it right. Proper inventory management is crucial, and it’s not always easy to master. You want to ensure you have enough product to sell to your customers, but at the same time, you don’t want to have too much inventory sitting around—especially considering the fact that you essentially pay for this out of pocket, as you won’t get the customers’ money until you’ve actually sold it. While it might be tempting to be overly cautious and have too much inventory on hand so you don’t risk running out, it’s a delicate balancing act; products can go out of style, expire, or become outdated in a flash. On a related note, it’s essential that you have accurate data to successfully master all aspects of the supply chain. This is especially true with inventory accuracy. Daily cycle counts of inventory are helpful here, and 100% physical inventories should be carried out at least once a year. Any variances between your systems and physical counts must be reconciled. Essentially, supply chain management all boils down to delivering your customers what they want, when they want it, while spending the least amount of money possible doing so.